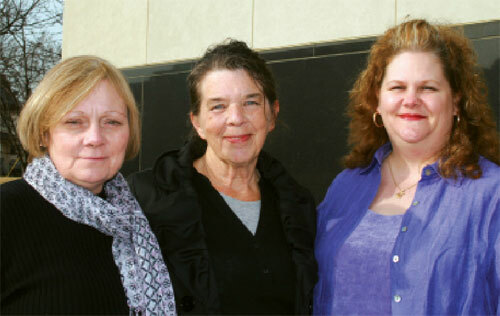 Child care providers Sherry Loar, Paulette Silverson and Michelle Berry fought the forced unionization every step of the way. As 2012 begins, the forced unionization of 56,442 so-called home health care workers in Michigan continues. Approximately 80 percent of those impacted by an unpublicized election six years ago probably did not know what was occurring. As a result, they were railroaded into the Service Employees International Union (SEIU). Union dues have been extracted from the taxpayer-funded checks they've received ever since. This represents a transfer of more than $28 million from taxpayers to the coffers of the SEIU. House Bill 4003 was designed to stop the dues flow, but it remains stuck in the state Senate. Meanwhile, tens of thousands of those who care for the disabled in their homes — including many who are just caring for relatives — are still stuck in a situation not of their own making. Dr. Dawn Lancaster, of the Conservative Caucus of Monroe County, said acceptance of the forced unionization sets a dangerous precedent. "Let's hope this nefarious arrangement is ended quickly,” Lancaster said. “If parent caretakers in low-income families can be classified as public employees, just because they receive Medicaid checks to assist them in the cost of caring for their own disabled adult children, my physician colleagues can expect to receive union cards any day." Dr. Lancaster's point is simple: If the state can force anyone who receives payment from the government into a public-sector union, this could include doctors (Medicare) and grocers (food stamps) as well. Thomas Stump, secretary of the Saginaw County Tea Party, said pressure should continue to be exerted on the state Senate to put an end to the forced unionization. “I understand a deliberative Senate concerning the making of laws,” Stump said. “But this is just plain corruption. The House is ready to end this now. Why the Senate delays is beyond me. I think it’s more than just political donations . . . of which there are many. There is something else going on here. Two forced unionizations took place while Gov. Jennifer Granholm was governor. One involved home-based day care workers. That situation ended shortly after Gov. Rick Snyder came into office. The forced unionization that has yet to be halted involved alleged home health care workers. It's necessary to use the word “alleged” because this unionization included family members who take care of disabled relatives and their status as “home health care workers” is debatable. Many who have looked closely at how the forced unionizations were accomplished say the scheme is ingenious. What occurred took place in what could be described as a covert manner. Any sort of news media coverage or public attention was avoided. The scheme cannot be fully understood without this context. Millions of taxpayer dollars are sent to home health care workers and others. This includes Medicaid checks sent to family members who take care of those who are developmentally disabled. To get about $6 million per year of that money transferred into union coffers. The assumption that employees would know whether or not they were employed by the employer. The assumption that employers would generally be working to prevent unionization, not trying to make it happen. The assumption that employees would be informed about unionization elections through word of mouth or bulletin board postings at shared work sites. Because of this assumption, it wasn't clear whether or not a public notice was required to alert the news media about upcoming unionization elections. A quick scan of the above information shows that the system might not have technically required that the general public and the news media be informed about what was happening. For the plan to work, keeping it below the radar was an absolute necessity. A state agency could not be used as the public employer because this would bring the matter before the state's Civil Service Commission and there it would have drawn attention and significant political fallout for increasing the state work force by 40,000-plus in an election year. But while a state agency could not be used to pull off the scheme, the employer would need to “employ” all of the providers. Therefore, in the case of the home health care scam, the dummy employer was the Michigan Quality Community Care Council (MQC3). An attorney representing the union certified that MQC3 was the employer. The so-called home health care workers had to fill out cards asking for a unionization election and a portion of them did. The cards listed MQC3 as their employer. It's probable that many, or most, of these people were told they were signing for a chance to get health care coverage and a wage increase. Since no one ever foresaw a situation where the basic status of employer to employees would be questionable, the Michigan employment relations structure simply accepted MQC3 as employer and the workers who signed cards as MQC3 employees. Had this portion of the plan taken place in a public forum, with the news media present, several issues would likely have been raised. For example, whether or not the workers were legally qualified to be public employees. Also, there is the issue of whether home health care workers who considered themselves as independent contractors or family members taking care of their own relatives should be considered as government employees. Subsequent developments indicate that the large majority of these people had no idea any of this was even going on. The Michigan Bureau of Employment Relations sent out 43,000 election ballots. Fewer than 20 percent of those affected by the election voted. This indicates that the vast majority of home health care workers and family members who care for disabled relatives had no idea what was happening. It seems likely that they tossed the ballots away as junk mail that didn't apply to them. How many more would have voted if the process had been done publicly, with the news media covering the election? Zac Altefogt of SEIU Healthcare Michigan (the branch of the SEIU directly involved) and Sen. Kahn both were offered the opportunity to comment on this article but did not respond.